Wayne Allen | Daily Times A meeting of the local Community Connectors School Mentorship Program was held Wednesday. 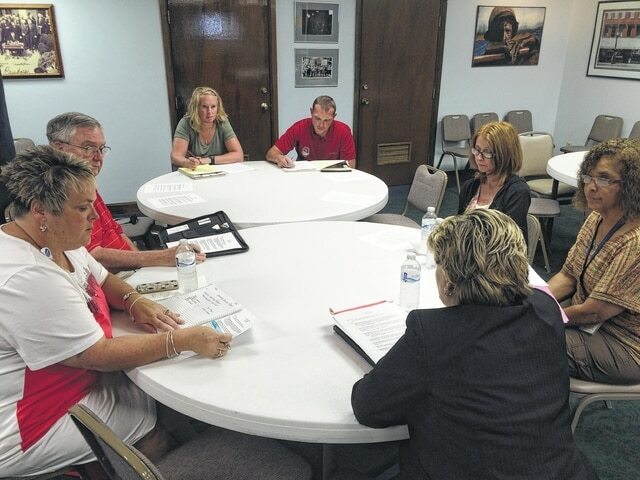 Community Action Organization (CAO) of Scioto County has received funding to bring Ohio’s new Community Connectors School Mentorship Program to the area. Luanne Valentine, director of employment and training programs at CAO, said the Community Connectors program was announced by Governor John Kasich, during his 2014 State of the State address. Funding for the program was made available though the Ohio Department of Education. There were 192 applications for funding; each application included a business, civic and values-based partner organizations. CAO was one of 82 community collaborations that will share roughly $6.8 million as they implement this program. Valentine said the goal of the program is to give more students access to role models who can help motivate and inspire them, as well as help them develop skills that lead to success in school and the workplace. As a part of the program, several community organizations have come together to mentor area students. Local organizations include, Southern Ohio Medical Center, Portsmouth Area Chamber of Commerce, Kiwanis Club of Portsmouth, Portsmouth City Schools, Sciotoville Community Schools and the Scioto County Career Technical Center. “The dedication to the youth in our community is overwhelming. Our partner organizations brought fresh ideas on how our collaboration could inspire more young people to think about their careers and the positive impact they can have on our community in the future.” said Steve Sturgill, CAO executive director in a released statement. Services that are anticipated to be offered include, One-on-One Mentoring, Group Mentoring, Worksite Mentoring, Peer-to-Peer mentoring and Tutoring. Other opportunities such as financial aid counseling, internships & paid work experiences may also be made available through one of the project partners. Students attending one of the Scioto County school districts in the 7-12 grades will be eligible to participate. For more information about the program, contact Valentine at 740-354-7545.